For distinct points p and q in a two-dimensional Riemannian manifold, one defines their mediatrix Lpq as the set of equidistant points to p and q. It is known that mediatrices have a cell decomposition consisting of a finite number of branch points connected by Lipschitz curves. 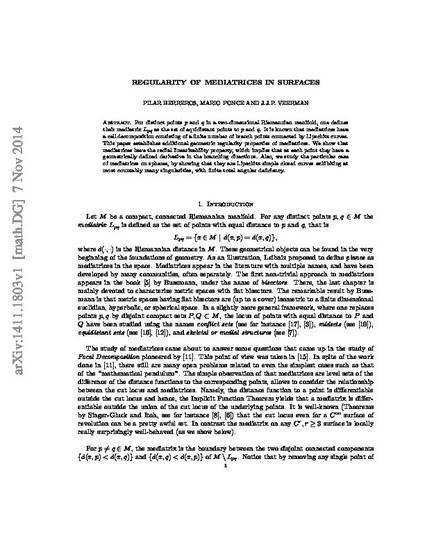 This paper establishes additional geometric regularity properties of mediatrices. We show that mediatrices have the radial linearizability property, which implies that at each point they have a geometrically defined derivative in the branching directions. Also, we study the particular case of mediatrices on spheres, by showing that they are Lipschitz simple closed curves exhibiting at most countably many singularities, with finite total angular deficiency. Pre-print of an article submitted for consideration to be published.